Fresh food and craft beer -- what more do you want? Located in the heart of lower downtown, Freshcraft boasts an ever-changing selection of the best craft beers in Colorado and beyond, not to mention some great eats. Good beer is best enjoyed with friends, fresh air, and a bit of adventurous spirit to sharpen the palate. Located in the Riverfront neighborhood just west of downtown, Denver Beer Co. specializes in artisan and seasonal varieties of premium ales and lagers made from the best ingredients around. The tap list is constantly changing - you may get the fan-favorite Graham Cracker Porter, the delectable Peach Saison or the hoppier-thatn-thou Fresh Hop IPA. They&apos;re all fantastic examples of great Denver beer. The patio is always a happening place to enjoy great beer and some Mile High City sunshine. With production of more than 17 million barrels of beer a year, the Coors Brewery (13th and Ford, Golden) is the largest single brewery in the world. 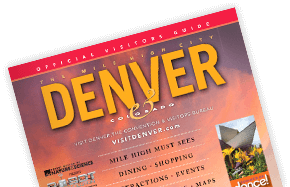 Located 12 miles from downtown Denver, the brewery experience includes a 30-minute self-paced tour through the malting, brewing and packaging processes, sampling of Coors fine products in the hospitality lounge and shopping in the Coors & Co. gift shop. Samples are limited in quantity and available only to guests 21+ with a valid ID. Non-alcoholic beverages also available. For decades, Denver has been home to America&apos;s largest beer festival -- the Great American Beer Festival® (GABF®). This event is so huge that just to imbibe a one ounce sample of every beer offered would mean drinking over 108 regular 12-ounce bottles of beer! Over 325 American brewers participate in the festival, serving over 1,700 different beers, ales, stouts, porters and lagers, all competing for the most coveted medals in the industry. More than 30,000 beer-lovers come to the event each year, taking place in October at the Colorado Convention Center.www.greatamericanbeerfestival.com.